The shirt of presidents and royalty around the world, Charvet, the world’s best known high-end shirt maker, has been run out of the same location since 1838. The seven story store on Number 28 Place Vendome in Paris offers customers as many as 6,000 different fabrics (in bolts and not swatches) to choose from for their bespoke shirts to be made, the largest such selection in the world. Their famous Wall of Whites has over 400 varieties of white fabrics in as many as 104 shades of white. As one writer put it, “Customers can debate not just the shade of white, not just the choice of cuff, not just the angle, depth and proportion of the collar, but also the infinitesimal differences in the weight of the interlining in collar and cuff and how this can and should be varied between formal, semi-formal and casual shirts.” For around Rs 35,000 online, you can have a ready-to-wear Charvet shipped to India. With its distinctive three-button cuff and hand stitching at the cuffs and collars, Turnbull & Asser has been the shirt preferred by British royalty and the rich for more than a century. Winston Churchill was a customer, so are British film stars. Men in all the big British movies from around the 1960s, most famously James Bond, wear Turnbull & Asser. The shirts are still entirely made at their factory in Gloucester in south west England. The ready-to-wear versions retail at around Rs 18,000 to Rs 20,000. This nearly century old shirt maker is based out of a town close to Milan in northern Italy. All shirts are made at its modern facility. Each shirt goes through 50 individual stages and takes about an hour to make. The sewing of the seams are carried out in two separate phases with two distinct, single-stitch seams to create a strong, soft seam. The finished sleeve is inserted into the shirt armhole which keeps the shirt from riding up when moving your arms. The yoke has no visible stitching front or back, and the outer piece of cloth is cut on the vertical, which allows for more comfort. The reinforced collars and cuffs are attached with two separate seams – unlike regular shirts which are produced with a single seam. 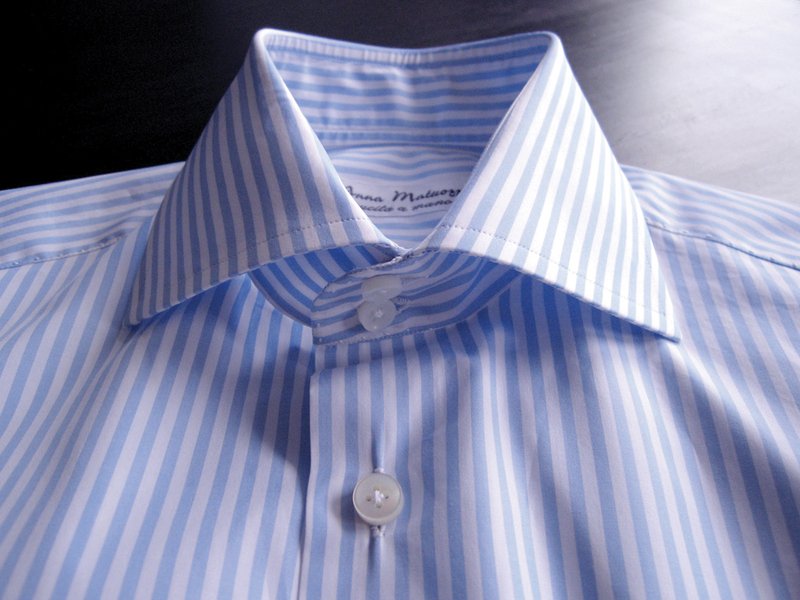 This extra seam produces a smooth appearance so that the shirt always appears fresh and immaculate. It retails at around Rs 15,000 a shirt. Based out of Bologna in northern Italy, Fray is a five decade long brand that is known for its continuing use of traditional tailoring to the point where hand irons are still used to iron each shirt before it is wrapped and packed. The sides, sleeves, collars and cuffs are all cut individually by hand to match the fabric grain and also to guarantee continuity of the pattern on the finished garment. The stitching on the shoulders, sides, wrist slits and front buttonhole bands are performed keeping in mind the continuity of the design. The shirts retail for around Rs 30,000. This relatively young company, founded in 1990, is based out of Naples and was established by Anna Matuozzo, who worked with the famed Neapolitan tailor Rubinacci for over two decades. In recent times it has become one of the most sought-after bespoke shirt makers by aficionados in Europe and America. Every shirt is still handmade by Matuozzo and her three daughters. Even the collars are woven by hand rather than fused. Borrelli shirts were first made by Anna Borrelli out of her home in Naples in 1900. The brand’s popularity among aficionados is thanks to her son Luigi. Each Borrelli shirt requires four hours to make through a nine hand-sewn operation. Its main features include basting the sleeve and collar to the body of the shirt, embroidered gussets at the bottom of the side seams and the attachment of the mother of pearl buttons with the traditional Neapolitan three-point chicken-foot stitch. They retail at around Rs 25,000 a shirt. Every Barba shirt sold since its founding in 1964 has been cut by hand. Their highlights include the cutting and finishing by hand; the front and the reverse of both the collar and the cuffs perfectly aligned in the lines; the sleeves hand sewn; the back and front side of the hips perfectly aligned; the placket seam following the fabric lines, etc. They are priced at around Rs 30,000 a shirt.